I wore this Saturday evening for another shower for my best friend's wedding! The theme was pink and black, so I took the opportunity to wear my new shift dress and then styled small pink accents. It was such a fabulous time and I can't wait for the rest of the wedding festivities! 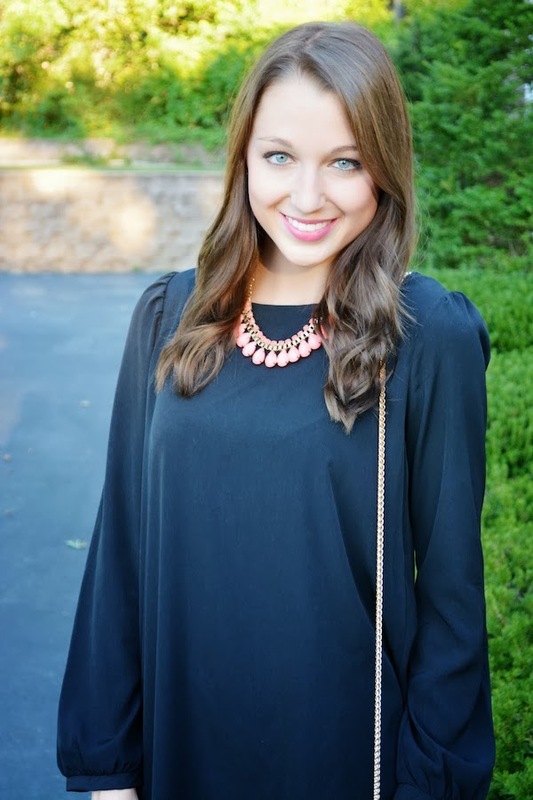 PS ~ don't forget to enter my Stella & Dot giveaway here! Simple and gorgeous, love pairing shift dresses with statement necklaces. I need to get a new LBD! I don't really like the two I have. You look great! Love the pop of color in this all black combination! Pretty Jacy! Love these shoes too. Cute dress! I need to add more long sleeve dresses to my wardrobe. Simple yet timeless! Fabulously done, Jacy! Lovin' the all black & pops of pink, lovely!